Bust is a Swiss street artist. His technical focus lays on freehand work sometimes supported by stencils. In 1999 Bust began his artistic career with classic Graffiti. Seeing stickers, stencils and posters on his travels through Europe inspired him for a further artistic development. Bust adopted a new range of techniques and skills which were helping him to realise new motives, statements and street art experiments. To communicate with the people through street art became a mission. He left his marks all over the world: New York, Berlin, Mumbai, London, Paris, Dubai, Cairo, Marseille, Amsterdam and many more. 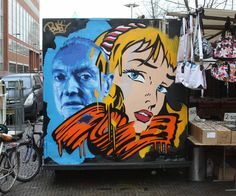 Bust painted over 200 pictures and stencils in the Netherlands and The 'Time Out' Amsterdam magazine has honoured his tireless work and mentioned him as one of 50 personalties that define Amsterdam in 2011. Bustis a neo-pop artist who feels entitled to tear characters and icons from their contexts to provide them a broader sense through new compositions. The road of Bust's consists of adapting, learning new techniques and applying them for further artistic progress. This process will inevitably lead to new creations. Furthermore, the street still is the most important medium for Bust. It makes communication possible with all passersby. This continues to be the greatest motivation of his art. There is still much to discover and to create. The big walls are waiting.